Fans of the Web-head rejoice! Fans of the Web-head rejoice! Since that sensational trailer, we’ve been practically starved of Homecoming-related info, but now we have something new to discuss. Hot Toys have released promotional shots of their impending Spider-Man: Homecoming merchandise, which includes an awesome replica of his homemade costume, and it’s the best look we’ve had so far. No longer do we have to scrutinize blurry trailer screen-grabs, since Hot Toys have displayed the suit from every angle. Check it out below! It’s Our Best Look Yet At Spider-Man’s Homemade Costume! We first saw the homemade costume back in #CivilWar, when Tony Stark (#RobertDowneyJr) pulled up some phone footage of Spidey’s early days and then again in the trailer for Homecoming itself. Here though, we've finally been given a clear and unhindered view of the prototype outfit that the wall-crawler designed for himself. Although it’s nowhere near as sleek as the suit that #IronMan gifted him, the costume is still a thing of beauty. Check out a selection of the best stills in the tweet below! Not bad at all, is it? The figurine is 11″ tall, with over 30 points of articulation, plus it has interchangeable hands, eyes and head, meaning that you can put #TomHolland’s lovely face on it instead of the iconic mask — if you so desired. The toy hasn't been given a release date or a price tag yet, so start saving your pennies now! Made up from everyday pieces of clothing, the homemade suit really emphasizes Peter Parker’s realistic budgetary concerns. The costume draws reference from both #AndrewGarfield and #TobeyMaguire’s prototype versions as well, featuring the balaclava mask and cumbersome DIY web shooters in pride of place. Spidey's new suit also draws a lot of influence from the comics — As the brightest #SpiderMan costume that we’ve seen onscreen so far, it’s almost technicolor red and blue sections recall the comic books of old. #Marvel Studios haven’t been shy when it comes to the accuracy of their heroes’ attire, and Spidey’s homemade suit stands as proof of this yet again. Additionally, fans will also note the inclusion of the hoodie as a significant feature. Yup, the filmmakers have clearly been styling this design on Ben Reilly, or rather the Scarlet Spider’s costume. For the more casual Spidey fan, the highly controversial Clone Saga featured a clone of Peter called Ben Reilly who fought crime alongside Peter, wearing a hooded version of the costume with inverted colors. As you can see, Scarlet Spider's suit is incredibly similar to the homemade outfit in Homecoming. Indeed, the exposed and metallic web shooters on the prototype costume also take point from this version, as well as Reilly’s subsequent makeover that ensued after he briefly assumed the role of Spider-Man in Peter's absence. Yep, the Green Goblin tricked Peter into thinking that he was the clone all along and — seriously, just don’t ask. It’s too damn complicated. All of these throwbacks complement the grounded and modern aesthetic of this very cool take on Spidey’s prototype costume. But does the existence of this figure signify what role it will play in the plot of Homecoming? How Will The Homemade Costume Fit Into Spider-Man: Homecoming? Many fans assumed that from Civil War onward, Spidey would stick to the suit that Stark had gifted him. However, following its appearance in the trailer and this latest unveiling, it’s clear that the homemade costume has a much larger role to play in the picture. Sure, the suit could just cameo for a few minutes if director Jon Watts chooses to include flashbacks to Spidey’s pre-Civil War days, but we’re inclined to think that the prototype outfit won’t be relegated to the past. After all, the first trailer for #Homecoming showed us a glimpse of it worn by a battered Peter as he faced down #MichaelKeaton’s Vulture on a beach, suggesting that Parker will don it once again further on in his career. But why would Spider-Man need to reclaim his old look if he has the swanky new suit? And wouldn’t that leave him very vulnerable to attack from the Vulture? Well, there are several possible reasons for this. The first is that the technological terror Adrian Toomes may have interfered with his costumes workings during battle with Spidey, meaning that it was either too damaged or compromised for Peter to continue using. Secondly, Stark may have confiscated the regular costume to prevent Peter from tackling the airborne antagonist. Stark recruited the young Peter Parker for Avengers duty in Civil War, and is clearly eyeing him for a more permanent position in Homecoming. 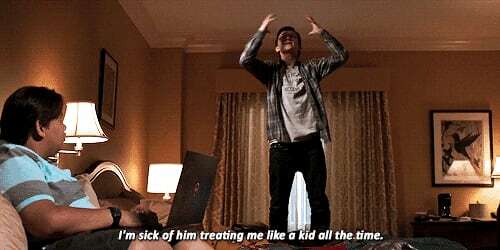 In the trailer he repeatedly puts strictures upon Spider-Man’s actions, discouraging the fledgling hero from crime fighting due to his lack of training and youthful inexperience. Perhaps Peter’s disobedience will force his hand? Alternatively, some of our Creators have surmised that Peter may get rid of the costume voluntarily. In the Civil War comics Tony and Peter were very closely allied, so much so that Iron Man gifted his protégé a powerful new outfit. However, as their partnership soured over the course of the conflict, Peter discovered that the costume had been assessing him far more invasively than he had initially realized, and he soon discarded it. Could Tony go that one step too far in trying to protect Peter in Homecoming, and instead cause a rift between the two heroes? Of course, we won’t know for definite until July, but the more and more we learn about Spider-Man: Homecoming, the more promising it becomes. With all of these intricate details and references being slowly revealed, even the more cynical Spidey fans are being reassured by the care and craft that’s going into the movie. Who knows, this may just be the most compelling and comic-book accurate incarnation of the webbed wonder ever committed to celluloid! Doctor Strange: Is Kaecilius The Answer To Marvel's 'Villain Problem'? Is 'Agents Of S.H.I.E.L.D.' About To Head Into A 'Secret Invasion'? Could Ms. Marvel Ever Join The Marvel Cinematic Universe?